Here's proof yet again that some of the cutest animals to ever walk the Earth are now long extinct — it seems islands in the Mediterranean may once have been crawling with tiny, tiny mammoths. The fossil teeth held in the Natural History Museum were originally thought to belong a dwarf straight-tusked elephant Palaeoloxodon antiquus, but researchers have now shown that the teeth are actually those of a mammoth, not an elephant. 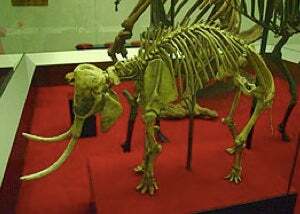 They now think M. creticus was most closely related to either M. meridionalis (who kicked around Europe 2.5 million to 800,000 years ago) or the older M. rumanus, which means the mini-mammoth may have hit Crete as long ago as 3.5 million years. This is an example of what's known as island dwarfism, which along with the companion island gigantism, means big animals evolve small, and small animals evolve big. The elephant/mammoth debate is part of a larger, ongoing discussion, which delves into DNA analysis as well. Regardless if this is an elephant or a mammoth, it would make an adorable companion pet with a pygmy hippo.